Due to a stabile social hierarchy, guinea pigs rely on their intuition to decide whether to compete or to escape. So far, there has been limited research on how the sexual cycle may shape female social behaviour in animals. Researchers from the University of Veterinary Medicine, Vienna, and the University of Vienna showed now that flight was the preferred strategy during experimental confrontation of two females during oestrus. If the animals were not ready to mate, however, their stress hormone level increased stronger and physical contact was more frequent. Also in female guinea pigs, Cavia porcellus, hormone levels fluctuate with fertility. These variations, caused by the rhythm of oestrus and anoestrus, may influence the social behaviour of the rodents given that guinea pigs naturally maintain a hierarchy in which dominant animals take advantage. A research team from the University of Veterinary Medicine, Vienna, and the University of Vienna analysed social behaviours and hormone levels to find out how female guinea pigs are affected by the oestrus cycle during the encounter with a female conspecific. The results clearly indicate that females tend to flee from one another during their fertile periods, but outside these periods they risked the confrontation. So far, there has been hardly any research on the influence of the "hormonal rollercoaster" on the social behaviour of female guinea pigs. "These rodents live in social hierarchies, similar to many other mammals. Such hierarchies are established through confrontations between conspecifics. Animals with a good intuition of when to compete or withdraw are more successful and better integrated," explained Lisa-Maria Glenk from the Unit of Comparative Medicine of the Messerli Research Institute. Stress hormones play a key role in this process because they mobilise energy for flight or fight in the body. "To gain a better understanding of how sexual and stress hormones modulate behaviour, we confronted guinea pigs with an unknown female conspecific in an experimental arena," said the lead author. 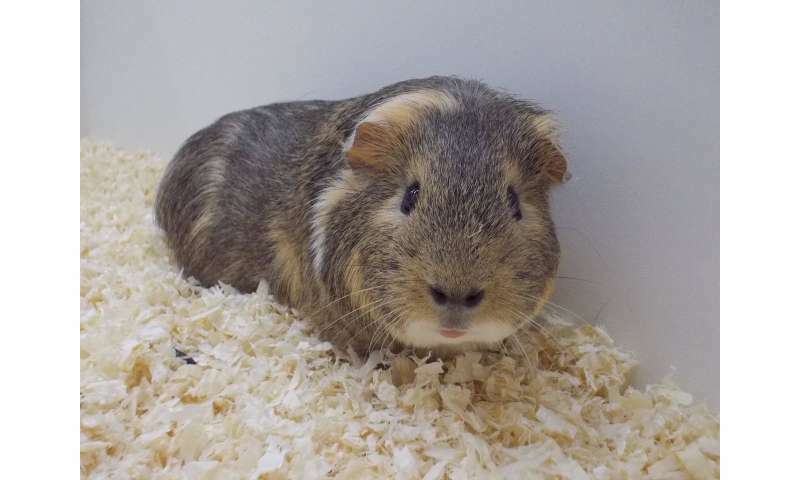 Together with her colleagues from the Department of Behavioural Biology of the University of Vienna, Glenk observed the female guinea pigs at two different times of the cycle: oestrus, i.e. the phase in which the animals are able to reproduce, which starts with the temporary partial rupture of the vaginal closure membrane, and anoestrus during which the membrane remains closed until the next fertile period. From the behavioural observations and laboratory results, the researchers concluded that aggressive behaviour occurred independently of the sexual cycle. When they were in heat, however, the animals fled from their competitors significantly more often. Peaceful "sitting together" was only observed during anoestrus. Furthermore, blood concentrations of the hormone cortisol before the experiment were lower in unreceptive animals, but significantly rose during the confrontation. There was only a marginal increase in the release of testosterone in both cycle phases. The results show a considerable influence of sexual cycle phase on stress hormones as well as social and flight behaviour. "It is particularly interesting that physical contact increased during anoestrus under the strong increase of cortisol. This behavioural strategy could serve as a stress buffer for the animals," said Glenk.